Real time immune response in a live animal. 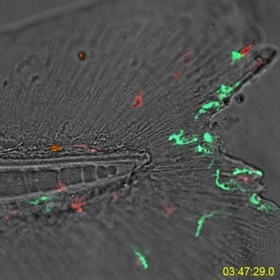 This video is a compressed four-hour time-lapse movie of neutrophils (expressing red fluorescent protein) and macrophages (expressing green fluorescent protein) migrating to the site of a tail fin wound in a transgenic zebrafish larvae. Images were acquired using confocal microscopy. Neutrophils and macrophages are white blood cells and are key components of the immune system. They are the first responders to sites of injury and infection. This zebrafish animal model allows researchers to visualize and study various aspects of the immune response in a real time living environment. The animation depicts a short snapshot of the evolution of Cyclus and Cycamore, projects under development in the Computational Nuclear Engineering Research Group, which conducts design and analysis of nuclear energy systems and fuel cycle concepts. Each dot represents a file, and each branch represents a directory. A developer changing a file is depicted by a light shining on that file. 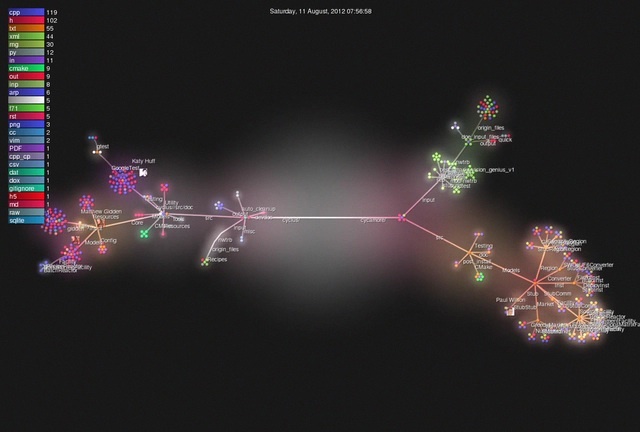 The image was created by the open source project, Gource, by simply looking at our work history. The full video is more than 10 minutes long. The featured projects and the project that created the video are open source and free for anyone to use. Sharing and learning in a free environment is increasingly important in both academia and science more broadly. The video also stands in as a historical montage, depicting, in a flash, the history of our research group. Scientific imagery, of course, is intended to help scientists. It is a critical form of data in many fields and can yield important and sometimes striking insights into nature and the way things work. But the pictures and other images of science can also have remarkable aesthetic qualities that the non-scientist can appreciate. That has been the philosophy of our Cool Science Image feature, published on this site for 18 years. Four years ago, as an experiment, The Why Files held its first Cool Science Image contest. 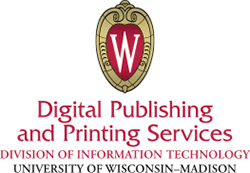 Limited to Why Files headquarters, the University of Wisconsin-Madison, the contest yielded more than 60 entries. The next year 84 Badgers entered the competition. Last year, there were 105 submissions. The 2014 contest garnered 94 submissions. This year also sees a new sponsor for the contest. 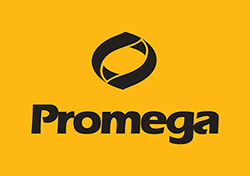 In addition to a generous contribution from Madison-based Promega Corp., DoIT Digital Publishing and Printing Services provides additional contest support. Choosing the winners was difficult, but our judges narrowed the field to ten winners, included in this slide show. In addition, this year the judges acknowledged two videos with contest awards. The experiment, we think, has been a success. Our goal now is to continue this as an annual event. We hope to grow the contest and help bring the visual beauty of science to a larger audience, an aspiration that can make all of us winners.